Last week I was a part of history. The king of Jordan, and the dean of USC signed an agreement to create a film institute modeled after USC in Akabah. It will aim at developing the film industry of Jordan and the entire region. Hopefully in the future the various cultures will be able to learn about one another through cinema. Here's two websites about it. One the official press release. 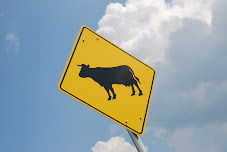 One a blog by those who are skeptic about the success of this venture. Amidst the militant anti Israeli speeches of the president of Iran and the angry reply speach of the president of the US at the UN and additional pro and anti speeches about Israel, the King of Jordan's actions were extremely brave. Like his father, he is a smart, charismatic and visionary king that is not afraid to take risks for the benefit of his people and the region in it's entirety. The Kings words and actions were not only a call to develop art in his kingdom, but also a call for dialogue between nations through culture. Thanks to the blogosphere, I've found out about an amazing cinematic project that will be established in Jordan. It is the Red Sea Institute of Cinematic Arts (RSICA) based in Jordan's Red Sea resort town of Aqaba. I first heard about this great project on Laith's blog and it really made my day knowing that such a highly needed institute would be established in Jordan. Kudos to all those behind it. When His Majesty the King approached me on the subject of a Jordan-based, world-class film school serving every country in the Middle East, including Israel, I immediately saw the importance and significance of such a venture for the people and the future of the region. I knew as a trustee of USC and a member of the school's Board of Councilors that the university had the exact expertise he needed for this incredible initiative. "... world-class film school serving every country in the Middle East, including Israel" The New Middle East? You can count me out. Thank you. I can't [wait] to learn filmmaking in Jordan to make films about terrorist Arabs. Regardless of the controversy, I see this project as the materialization of the dreams of so many aspiring Jordanian and Arab movie makers. I am excited. Monarch agrees to create Middle East institute in Aqaba, where qualified candidates can learn about film technique and other cultures. 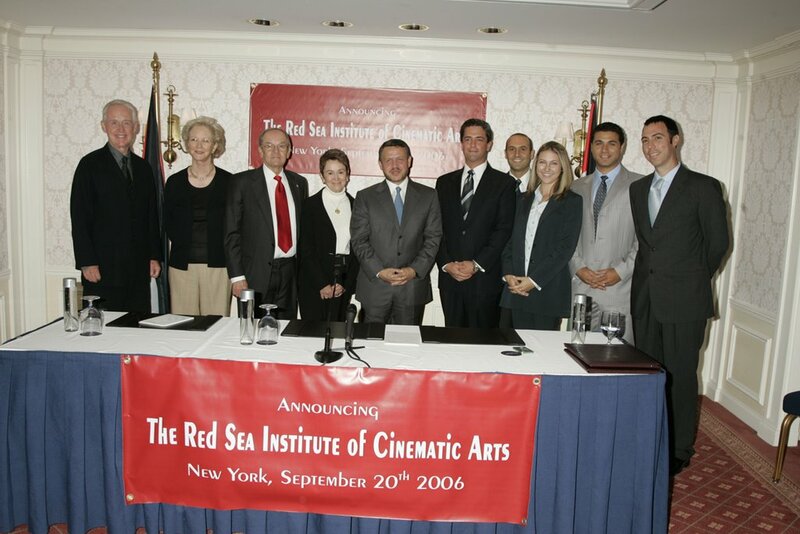 King Abdullah II of Jordan today presided over a ceremony in New York City marking the creation of the Red Sea Institute of Cinematic Arts (RSICA) in Jordan’s Red Sea resort town of Aqaba. 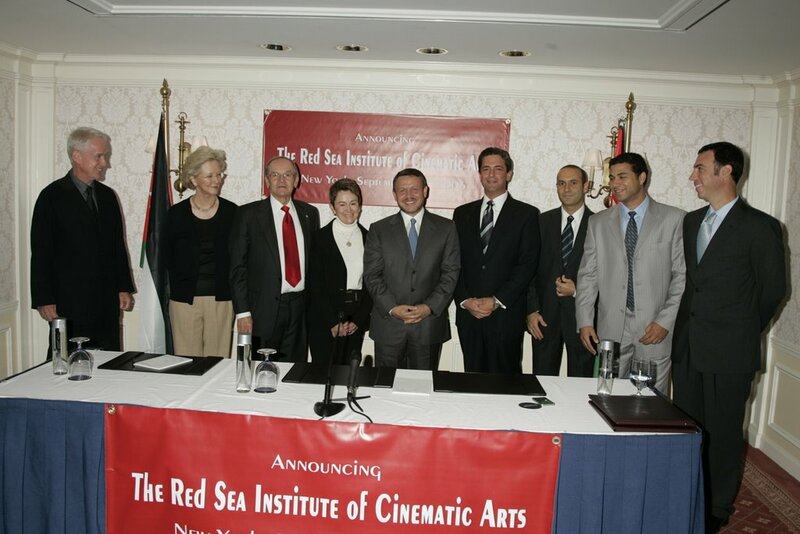 The institute is a joint effort of the Royal Film Commission of Jordan and the USC School of Cinematic Arts. 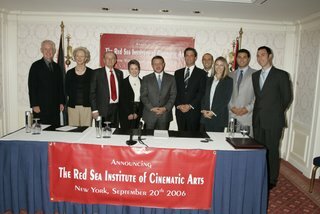 The institute will enroll men and women from the Middle East region in a specialized learning environment dedicated to teaching all disciplines of the cinematic arts. The official ceremony took place at the Jumeirah Essex House in New York City. Participants in the event included Elizabeth M. Daley, dean of the USC School of Cinematic Arts; Frank Price, chair of the school’s Board of Councilors and USC trustee; Samer Mouasher, commissioner of the Royal Film Commission of Jordan; filmmaker Dan Katzir; and producer Malek Akkad. The Red Sea Institute of Cinematic Arts is in line with Abdullah’s efforts to harness the skills of Jordanian youth by exposing them to the latest technologies in filmmaking and production. The institute also would contribute to the monarch’s vision of establishing a hub for intellectual and creative capital in Jordan, where youth in the region can be equipped with the necessary tools for success. Abdullah drew on the expertise of filmmaker Steven Spielberg, who recommended the partnership with USC, to make this project a reality. “When His Majesty approached me on the subject of a Jordan-based, world-class film school serving every country in the Middle East, including Israel, I immediately saw the importance and significance of such a venture for the people and the future of the region. I knew as a trustee of USC and a member of the school’s Board of Councilors that the university had the exact expertise he needed for this incredible initiative,” Spielberg said. USC faculty and staff teams traveled to Jordan to conduct pilot programs in 2005 and 2006. Those experiences now will be formally expanded into the RSICA, a fully accredited and free-standing graduate school that will offer a three-year Master’s of Fine Arts degree through advanced education in cinema, television and a wide range of screen-based media. Construction of the RSICA campus is set to begin in early 2007 in Aqaba, a special economic zone in Jordan on the Red Sea bordering Saudi Arabia, Egypt and Israel. Its facilities will include digital screening rooms, postproduction, animation and interactive media laboratories; sound stages with green-screen and motion-capture capacities; high-end professional video production packages and an extensive digital and print library. Faculty will be drawn from industry, arts and academic institutions around the world. Students will be admitted from Jordan and the entire region, with first admissions in September 2008, and the first graduating class in June 2011. Admission will be based on a competitive portfolio, clear evidence of talent and outstanding personal expression as well as strong potential for creative collaboration.